The story of Jesus Healed a Man Who Could Not Walk, found in Mark 2, is an exciting example of the miracles performed by Jesus. 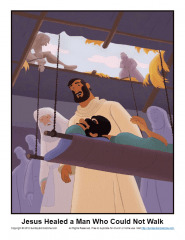 This illustration shows the man being lowered down through the roof so he could get to Jesus. It can be used as part of a Bible teaching session or as part of a children’s sermon.